For quite a few years now I’ve had countless MK1s coming to the garage with the same old problems. They all seem to be prone to the same fault sooner or later at some time in their life. We are all aware of the infamous 5th gear popping out on post 120,000 mile cars and drop link failure from 60,000+. However one aspect of MK1 troubles has escaped any real attempt to cure the problem, and that’s the cold start waxstat valve ( or Auxilary Air Valve )syndrome as I call it. I’d say one in 4 MK1s I see have a problem with this valve, for those of you who are unaware of its function it keeps the idle high on the engine during starting until the engine has warmed up. This however raises a few problems and far be it for me to criticize the design of our beloved cars I’m afraid Toyota didn’t quite get it right when it came to the cold start system. The problem lies in quite a few layers, one of which is the annoyance that even if you have a fully functioning waxstat valve with no problems at all it seems to take forever (especially during the colder months) for the idle to return to normal after starting. Indeed I’ve noticed on many occasions that it sometimes takes up to 3 miles of driving before it settles to 900rpm. Many of you won’t be aware that there is in fact no need for the waxstat valve to stay open this long and in fact a few hundred yards of driving or 60 seconds of idling sees it capable of doing without the choke. This in turn means that for an extra 2 miles or so the engine is drawing in more air than it needs and in addition is being supplied with the extra fuel to compensate…not good for our fuel economy! The waxstat basically allows extra air to be drawn past the throttle to simulate throttle being applied when the engine is cold, the map sensor informs the ECU that this extra air requires fuel and that’s our choke. The second waxstat problem is that frequently they stick open, that is, even though the engine has reached running temperature there’s still an extra amount of air leaking past the throttle and the ECU allows more fuel for that. However the ECU is now being told by the throttle position sensor that the throttle is shut, so on the one hand its being told I have the throttle open (the air leak) please give me fuel, and on the other hand the TPS says throttle shut reduce fuel and the end result is a surging idle as the ECU battles in conflict between the sensors. I’m sure at one time or another we have all witnessed this surging idle when the cooling system has become air locked or the waxstat has stuck open. OK, that’s the problem fully explained and I started research work into a solution to the problem over a year ago. It occurred to me that the system we have got is all fine and dandy if you live in Japan, nice hot days when the engine gets up to temp straight away and indeed this is the climate that this system was designed for. It seems the that UK spec cars were ignored in respect of the climate we have to endure for 8 months of the year! So a little bit of retro thinking was called for, remember the days of old Morris Minors, Minis and even old Fords when it was a joy to turn the choke off as soon as things got going? Indeed things all seemed to go pear shaped shortly after that with the introduction of automatic chokes appearing for every make and model. Countless complaints of dreadful fuel economy ravaged through the motor trade and even today it seems many cars, even with advanced electronic fuel management systems, still suffer from over fuelling during cold start. I enquired about the cost of a new waxstat valve from Toyota…£140! and at the end of the day it still has the inherent problem of staying on for far too long. So a cheap manual choke conversion was clearly the answer. 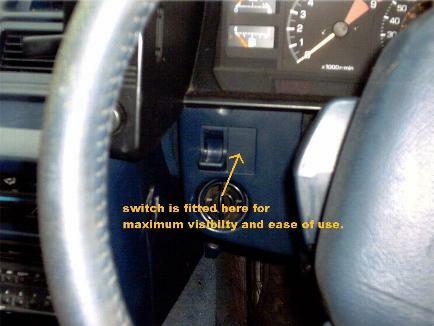 Not some pull out cable operated affair like in the good old days but a simple dash mounted switch that can be flicked on or off to control the cold start. After much toying with the throttle body on a MK1, I found that Toyota weren’t such idiots after all and they have conveniently supplied an extra air pipe on the throttle body that I could use for my own system. Indeed I found I could leave all of the original Toyota waxstat system in situ and not even remove a single piece of it, which is good news for the MK1 purists among us. The system I came up with is merely an “add on” which can be removed from the engine at any time with no side effects. The standard waxstat is simply disabled by blocking off its auxiliary air supply with a plastic tyre valve cap, indeed many of you will be aware of this mod as a cheap fix for a waxstat that has given up permanently. The manual system consists of a 12v switching air solenoid that plumbs directly to the throttle body and feeds from filtered air on the air filter piping, there’s no holes to drill and no modifications need to be made to the standard set up. Simple wiring consisting of ignition controlled live feed to the solenoid via a switch on the dashboard is all that’s required to make this work. It took me many months of searching for the right solenoid valve to come up with one with the correct flow rate for the job. 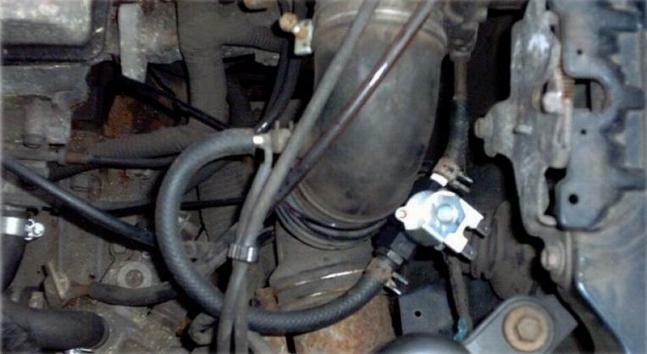 Below is a pic of the valve and piping in situ on a MK1. Testing of the system took place on my dear wife Becky’s MK1 t-bar, I wanted to be 100% sure that the system had no drawbacks or problems. Over the next few months Becky was very pleased with her new gadget and although she often forgot to actually switch the choke on for several mornings, habit soon took over and it was then commonplace. Her place of work is only a few miles away and she found that instead of the Toyota system gurgling fuel for the whole journey she could turn the choke off by the time she was at the end of our street and the car would idle perfectly. Success at last and after a few weeks of this she was reporting a fuel saving of nearly £5 a fortnight…not bad! It has to be added that the system will have absolutely no effect on hot running fuel economy and the fuel economy you got before the system was fitted will remain the same, however it’s during cold start where the saving is made. This was Paul's original system and the kits are still available. However he has recently and very generously made the following information available to all ! See the "Related Articles" links at the bottom of the page to read all about it. Well I bought over 20 different solenoids in an attempt to find one that worked how I wanted, but there's a Toyota valve already fitted to certain cars thats absolutely perfect for the job....and it keeps all the equipment Toyota, you will like this! Get your hands on a MR2 MK2 air conditioning idle up valve ( VSV ), it has two pipes on it and two wires,so easy to connect and even has a variable outlet on it so you can alter the amount of cold start high idle you want... installation is the same as above and you can adjust the cold idle speed to a level that suits you by adjusting the screw on the VSV.